Mozy review from BestBackups, examining the service's pricing, features, customer support, security and ease of use. It’s hard to fault the quality of Mozy, with its excellent security and well-developed range of traditional backup features. Somehow, however, it just fails to meet the standards of its competitors, largely due to a lack of file sharing options and limited storage space. You can read a detailed review below or sign up now. MozyHome offers three plans for personal users to choose from. To get you started, there’s a free subscription that offers 2GB of storage space, as well as the option to earn an additional 256MB for every friend that successfully signs up on your recommendation. There’s no time limit on this plan, although it’s not advertised on their main pricing page. Instead, you’ll need to navigate straight to the MozyHome Free page. If 2GB just isn’t enough, then there are two paid plans available as well. If you’re happy to back up from just one computer, you can get yourself 50GB of storage space for $5.99 per month. Those with more devices can pay a monthly fee of $9.99 for 125GB and the option to back up files from up to three computers. If you’re looking to cover the whole family, you can also choose to add additional computers to your account for just $2 per device per month. You can also purchase an extra 20GB of storage space for the same monthly price. There’s something nice about this create-your-own-style plan, but given that Mozy’s main competitors largely offer unlimited storage for lower monthly prices, it does suffer by comparison. Business users have a few options too, with MozyPro plans ranging from 10GB for $9.99 per month to 1TB for $379.99 per month. All business plans allow users to register an unlimited number of devices, and a customizable Enterprise plan is also available, with fees upon request. If Mozy seems like your cup of tea, then payment can be made by Visa, MasterCard, Discover or American Express. They also have a returns policy, entitling any user that cancels their subscription within 30 days of purchase to a full refund. Alternatively, if you commit to an annual or bi-annual account, you can cancel within 90 days and receive a repayment for all months outstanding. Mozy is one of the longest-running backup providers, founded in 2005 by Josh Coates. Ten years later it’s as strong as ever, and is now owned by EMC Corporation – a giant in the fields of information management and data storage. Today, it’s one of the best-known providers on the market, boasting over 6 million customers around the world, as well as more than 100,000 business clients. Mozy operates an automatic backup system, keeping your files up to date on its Tritanium Cloud servers as well as giving you the option to synchronise them across all of your devices by downloading Mozy Sync. Uploads run in the background while you work and, unless you want to manually select which files to back up, you can simply set Mozy up and let it run. Selecting individual files to upload is not the simplest process but, on the plus side, there are no limitations on the size or type of files that you can upload – so long as you don’t exceed your storage limit. If you prefer a little more control over how and when Mozy runs, you can also set a backup schedule to ensure that uploads only take place at times that suit you. Mozy is compatible with Windows and Mac operating systems, as well as iOS and Android phones. Mobile applications host all of the same features as their desktop counterparts and are subject to the same security measures. Mozy doesn’t currently offer any file sharing options, which comes as something of a disappointment given the high demand for simple sharing features in the backup market today. Given its limited storage space, I would have expected Mozy to make up the difference by being more flexible with its sharing options, as not doing so seems likely to lose the company their edge in this fast-moving industry. On the plus side, Mozy has recently integrated file synchronisation between multiple devices into their service. Downloading the Mozy Sync client creates a Sync folder, into which you can place any files or folders that you want to access on the go. These will then be automatically synced to all of your registered devices, so that you can work on your files anywhere without having to carry a laptop around or worry about losing a vital USB. File versioning is a great service that allows you to access previous drafts of your documents even when they have been overwritten by newer versions. While some providers offer unlimited versioning services or cap the number of versions that can be saved, Mozy allows you to hang on to older copies of your work for a maximum of thirty days. While this isn’t as extensive a time as some providers offer, it can be a great help if your files get corrupted, or if you find yourself hunting for information that you’ve since replaced. In addition to this, any data that is deleted will also be kept for a thirty day period before being permanently removed from Mozy. Finally, it’s also worth noting that Mozy is not the best choice for archiving files to free up space on your hard drive, as once a document has been deleted from your computer, you’ve got thirty days before it’s removed from your Cloud storage forever. Mozy account holders have the option to extend their backups so that data is saved not just to the cloud, but also to a local storage device (typically a removable hard drive). This adds an extra layer of protection to your backup, as well as making it possible to store files without an internet connection. This also means that if you’re fed up of slow internet speeds you can cut your waiting time, as local backups are much faster than their online counterparts. All local backups run automatically, and your storage limit is shared with your online account – so free users will get 2GB, and paid up MozyHome subscribers will get 50GB to use across both devices. While it’s highly recommended that you back up your data in at least two locations, there are a few drawbacks to Mozy 2xProtect. For one thing, there are no file versioning options, and it’s not possible to retrieve deleted files – meaning that if you accidentally remove a file, you’ll need to manually upload it again. More importantly, no files stored in 2xProtect are encrypted. While Mozy claims that this is to make it easier to share stored data with others, anyone concerned about the drive being lost or stolen may wish to encrypt their files independently before backing them up. If you need to restore your files in a hurry and don’t have time to wait for a dodgy internet connection, Mozy also offers users the option to retrieve data using an external storage device. When you request a media restore, they’ll copy all of your files from storage onto a DVD or removable hard drive (encrypted of course), and ship it to you directly – saving you time and effort, and ensuring that your data reaches you as quickly as possible. Mozy boasts some impressive security measures, with files transferred via a secure SSL connection and subject to end-to-end encryption. This means that all files are encrypted before they even leave your computer, and remain so until they’re safely back in your hands. You also have the option to set a 256-bit private encryption key, based on a personal password that is never shared with Mozy. This is a great way to ensure that only you will ever be able to decrypt your data, although Mozy won’t be able to help out if you lose or forget the password, so you’ll need to keep a record of it in a really safe place. Alternatively, you can also choose to opt for a key that Mozy themselves control, which is covered by 448-bit Blowfish encryption. The technically-minded amongst you may also like to know that Mozy completed a full SOC 1 SSAE 16 type 2 audit and is the proud recipient of ISO 27001 certification. Once located on the Mozy servers, your data is kept safe in a climate controlled storage center that features biometric scanners and backup power sources, and is observed around the clock. If you want to contact support staff directly, all paid up users can reach them via live chat or email, while business subscribers get support around the clock and also have access to a phone support line. Free subscribers don’t get these privileges, unfortunately, although they can access the company’s Support Portal, which includes a knowledge base covering a variety of different topics, as well as video tutorials, forums and user guides (found under ‘documentation’). My contact with Mozy support was all positive, with an email request answered within six hours, a helpful Live Chat, and consistently useful information sent my way. The Mozy Facebook page features fairly regular posts containing light-hearted company news and promotions, as well as occasional re-posts of industry-related news. Their Twitter is much more active, with 16,000 followers and several tweets posted every day while their blog looks a little drab but contains regular, in-depth articles. If you’re looking for troubleshooting help or advice, you can also try the Mozy Support Twitter feed, which is devoted to solving user problems, although most enquiries are directed straight to the Community forums or email support. The Mozy Backup software is easy to install, with its 12.7MB file taking just a few minutes to download and run. On first use, you’ll be given the choice to run an automatic backup of all of your files, or to manually pick a selection. You’ll get an estimated duration for this initial backup, which can be several days or even weeks for larger quantities of data (although you’ll find similar timings with almost all online backup providers). To sweeten the deal a little, Mozy helpfully allows you to access files as soon as they’ve been uploaded, so you don’t need to wait for the whole process to finish before you can get to any of your documents online. Unlike many providers that allow you to upload files directly to their website, you can only back up files to your Mozy account by using the Backup app. From here, you can also restore your saved files, as well as changing settings including your backup schedule. So far, so simple, but it’s worth being aware that you can’t back up files directly from the home screen of the desktop client. Instead, you’ll need to go into settings, select ‘Backup Sets’ or ‘File System’, then scroll (with difficulty) through an inconveniently tiny box of your hard drive’s file locations. A much simpler route is simply to find your file or folder, right-click it and select ‘Add to MozyHome backups’; although this is not so convenient if you want to back up lots of data. There’s a third way to back up your files as well; by using the Mozy Sync program. Once installed, this creates a folder on your hard drive into which you can move or copy files. These are then uploaded instantly to the Mozy website, where they can be viewed at any time. By contrast, files uploaded using Mozy Backup can only be restored, not viewed online or from other devices. Unfortunately, Mozy aren’t big on simple explanations, so my understanding of their software came mostly from trial and error. It won’t pose much of a problem to experienced users, but anyone not entirely confident with navigation may find themselves confused. The Mozy mobile application is somewhat limited; you can view and download backed up files, but there’s no option to upload data from your mobile device or change any settings. Downloads are very speedy, and it’s easy to navigate the app, but the lack of features means that its use is fairly restricted. 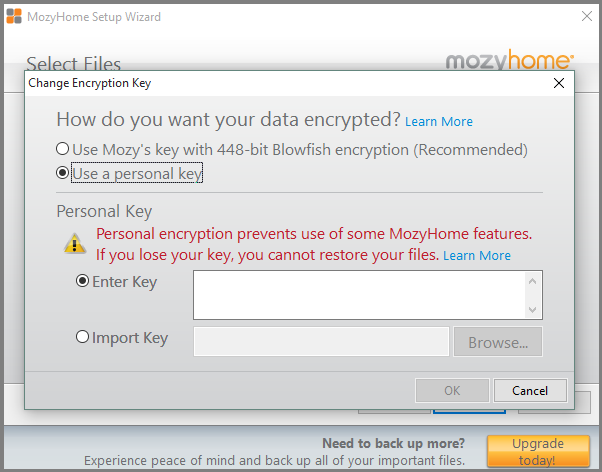 Mozy is a solid backup service with well-developed features and a professional finish. Unfortunately, limited storage space and a lack of file sharing options means that it struggles to reach either a file sharing audience or one that wants to back up large quantities of data, leaving it a little too basic and old-fashioned to lead the field in either market. Having said this, it’s hard to fault the program’s security, and almost all processes work well; so those looking for a simple service should do well with the tried-and-tested basics that Mozy offers. What do you make of Mozy? Leave a comment with your thoughts.